Five of Pentacles says you are experiencing worry – concern about the external things involving communication, health, finances, creativity, work and relationships. Take time to review what is happening in your life and what you really want. You are allowing your heart to rule your thinking – your emotions are involved and you can not see just how good life can be. Challenges of deprivation, insecurity and exclusion allow you to experience the upset that occurs when every effort towards stability is denied and everything you want to hold on to is taken from you. They help you recognize the transitory nature of physical and material desires. New opportunity awaits, new possibilities – a better way will now be presented. Recognize that strategic review, regrouping and realignment are all necessary steps of forward progress. Channel all your thoughts and energy into your spiritual development, for it is here you will find rest and relief. When your home, work or security is threatened – choose how to handle it. Work at your situation slowly and steadily, trying different things until you get a combination that holds together and despite the hardships, you will continue to progress towards your goal and your rewards will be as great as your belief in what you can achieve. This card represents movement, but the activity in this phase is within a limited range, while there is pause to take stock of your physical world before committing. Which among the good choices is yours? There is inherent restlessness in this state – a positive instability that will eventually necessitate change. This is a time for repairing the nets so that you will be ready when the fish come. The self is adjusting to an increased demand on the soul, to give priority to others as well as self, primarily family and friends. In the first position: It is especially hard to ask the Spiritual Plane to be patient, for the soul is ever so hungry to be reunited. But patience is the byword for this lifetime. Many of the qualities contemporary society does not value will be the hallmark of your path. Remember, in the right context, the ability to take it easy is a virtue of the highest order. Rest assured that this would not be your Karmic Path if your bases were not to be covered while you are taking a break. In the second position: You are similar to the cat who can always land on her feet. You re resourceful in the hardest of circumstances, your instincts for survival close to that of an animal. Your physical/material demands are not that great. But like the tortoise and the hare, you, the tortoise, always get where you want to go, frequently before the other guy. In the third position: Lack of movement, of apparent growth at the physical level. Your soul is waiting for things to line up, to catch up with each other. Gates must be constructed for us to move through. In the fourth position: You love your physical freedom and your relationships, be they friend or lover, will have to give you a wide berth. This is not to say that you can not be both an excellent friend and a good lover, but your ground rules will have to be accepted. In the fifth position: The mind is centered on the interim in your physical world allowing a reprieve. Rest and relaxation may be on the schedule. You may be occupied with mental pastimes. In the seventh position: There is an appropriate lull in your affairs this year. Your mind needs the rest. In the eighth position: Time out. Vacation. Rest and Relaxation. Do the things you could not otherwise if you were in your normal routine. In the ninth position: The heart is helping you find happiness, whatever your circumstances – to enjoy leisure if that is your good fortune, to be able to find the silver lining in your physical troubles if that is your present lot. It offers no explanations, no excuses, just love. In the tenth position: There will be a plateau in your Physical Plane to enable you to catch your breath. In this interim there are numerous tumblers that will be aligning to open your next gate. Use your time productively and the interim will be short and pleasant. I just got a five of pentacles as an outcome to a question where I asked if I would experience successfully saving close to ten thousand dollars by next year. I don’t know if it is correct but I feel that i am being pushed to this conclusion that, it’s going to be tough and hard to save the money and while saving I will have a lack of resources left over but the period of discomfort will be short and once the goal is reached I will have opened up the next door/ chapter to my life. Idk if this makes sense or if I am trying to make myself feel better. I just wanted to tell you about this latest spread I have just completed,because it is one of the most positive ones I have gotten, I did a tree of life spread for myself,the results are as follows listed in the order of draw. 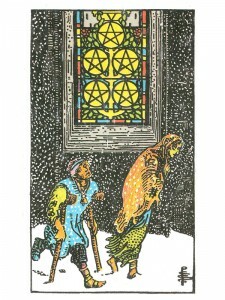 Yes, the 10 of Cups found next to the 5 of Pentacles is an indication that the outcome could be a good one. However, it does not mean there will not be a transition to get to that outcome.